Here’s a riddle… What can’t be turned off, deleted or filtered…? Traditional ad media. Particularly banners, posters and window signage. They’re still preferred and effective channels of brand messaging. Recent studies show that 9 in 10 consumers believe printed materials will always be needed. * A whopping 70% of respondents reported having items professional printed the same amount or more than the previous year. The truth is… digital advertising (Search Engine Marketing, Social Media, etc). works perfectly in conjunction with print marketing. If anything… they depend on each other. These staggering stats are particularly true for millennials. Nearly half of respondents to this study – aged 18-34 – reported having something professionally printed at least once a month. Overall, 85% of consumers said they’re more likely to shop with a small business that has printed materials, such as business cards, signs, flyers or banners. These communication pieces solidify and legitimize a business’s place and presence. Just as a website and social media presence does. If you have a brick and mortar, you simple can’t have one without the other. Even full eCommerce business use print as a component to their marketing… but I digress. So how do you do signage right? You need to stop them in their tracks. The right print medium can trigger the right emotions. Bring your brand message to life, create a feeling, and just like that – your brand has made an impact. A 2014 study by USA Touchpoints found that place-based media, such as signs and banners in restaurants, malls, stadiums and cinemas, achieve a 54% positive emotions rate and a 99% reach. Why does working with a G7 printer matter? The FedEx survey clearly showed that buyers were equating the quality of print with the quality of service. A good printer should counsel you on the ideal weight of vinyl for a location; whether a blockout layer is necessary to prevent light from showing through; on the use of UV-Resistant inks and high-resolution printing; and other finishing processes to make sure your piece holds up to the elements. Customers of G7® Master Qualified printers benefit from the most modern technology, techniques and process controls available today in the graphic arts industry. Achieving color consistency when printing on multiple platforms, in various geographic regions, is a critical component in brand management. Success is when we help our clients represent their brand accurately and accurately. When you succeed, so do we. Let us be your ONE SOURCE for all things branded. Have you found your brand purpose? A few days ago, I gave my toddler a toy catalog and a marker. I said, “circle what you hope Santa will bring you.” He happily obliged, and now it’s all he can talk about. He’s been asking to review his selections over and over. I had planned to take his list from the toy retailer catalog and purchase them on Amazon instead (hello, free two-day shipping). Ironically, a few days later, I came across an article on Promo Marketing. Get this… Amazon is going to be printing a holiday toy catalog this year! The catalog is said to contain QR codes to help end-users find items online. Obviously, Amazon knows that printed catalogs offer brands a whole host of benefits. Last year, 9.8 billion catalogs were mailed within the U.S. This leads us to the revelation that millennials actually appreciate information in catalog form. It is vital for businesses to continue to produce catalogs if they want to remain in front of the up-and-coming generations. “Those who declare print dead are wrong, and those who feel it is beyond salvaging are equally incorrect. Sales are the name of the game, and, if incorporated efficiently and regularly, catalogs will make more than a splash,” said Myers. Consumers are expected to receive Amazon catalogs by the end of this month. To many, it may look a bit retro, but it will also help consumers recall the guides that Toys R Us used mail out. This is sure to make the holiday season a very merry time for the public and Amazon’s bottom line. Consider Tru Art to be your best choice for print and catalog manufacturing in the Midwest. What is G7 and why does it matter? 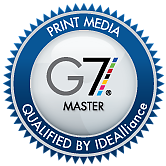 G7 Master Qualification is a sought-after recognition of excellence i n printing, and identifies print service providers that excel in implementing the G7 Proof-to-Print Process. A G7 Master Qualified Printer implements a calibration method that allows printers to achieve a visual simulation across multiple print platforms. Tru Art joins an elite group of print service providers who have successfully proven capable of providing the highest quality color printing. Customers of G7® Master Qualified printers benefit from the most modern technology, techniques and process controls available today in the graphic arts industry. Achieving color consistency when printing on multiple platforms, in various geographic regions, is a critical component in brand management. The G7 program is managed by IDEAlliance®, a not-for-profit association of leading print and electronic media service providers and their technology partners. As a global association, IDEAlliance is dedicated to guiding media production best practices, specifications, and standards, worldwide. Our goal is to work alongside our clients to become brand stewards. for. Success is when we help our clients represent their brand accurately and accurately. When you succeed, so do we. We’re your one source for all things branded.